Browned Butter Honey Garlic Salmon is a Cafe Delites original recipe! 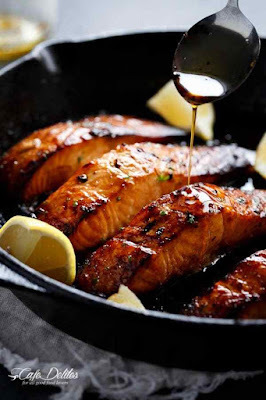 Salmon steaks pan fried in browned butter infused with garlic and honey, then grilled/broiled for an extra 6 minutes for extra golden, crispy and caramelised finish. The browned butter cooks right into this salmon and the honey and garlic give it such a beautiful flavour and charred finish in the oven. Browned Butter Honey Garlic Salmon is a great way to change up any salmon dinner! Only 3 main ingredients in under 15 minutes! Place butter in a cast iron skillet (or an oven-proof frying pan if you don't have a skillet). Cook over medium heat, stirring and swirling pan occasionally for about 3 minutes, or until the foam settles; the butter begins to change in colour to golden brown and has a nutty fragrance. Add the salmon steaks to the butter in the pan; cook each fillet (skin-side down if there's any skin) for 3-4 minutes or until golden, while basting the tops with the pan juices. Season with salt and pepper, to taste. *For a mild garlic taste, use 2 cloves. For more flavour in your sauce, use 3 cloves! Pre-heat oven to 410°F (210°C). Follow Steps 2-3 as above. At Step 4 when adding the fillets into the skillet, transfer to oven to bake for 4 minutes (depending on the size and thickness of your fillets). Broil (or grill) for 2 minutes to get nice charred edges. 0 Response to "browned butter honey garlic salmon"